KATHMANDU, Dec 22: Five major political parties failed to reach a solution to resolve current political deadlock despite discussing for two hours at Office of the Prime Minister, Baluwatar. Prime Minister Sher Bahadur Deuba had invited Nepali Congress, CPN (UML), CPN (Maoist Center), Rastriya Janata Party and Federal Socialist Forum Nepal to reach a common consensus on the National Assembly election Ordinance. The Ordinance is stuck at the office of the President since October 23. Two days ago, President Bidya Devi Bhandari had urged political parties to reach an agreement on National Assembly Election system. A dispute between the Nepali Congress and CPN-UML has delayed the Ordinance’s authentication. The Nepali Congress is demanding for single transferable voting while CPN-UML is for multiple transferable voting systems. “KP Oli has said claimed that the Ordinance was unconstitutional and therefore, should be called back,” Ramchandra Paudel, Nepali Congress leader said adding that Oli’s remarks were inappropriate and the Ordinance was practiced globally. “The Ordinance must be endorsed to form a new government.” Paudel said. 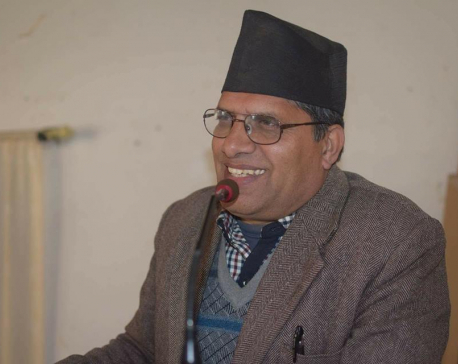 He added that Nepali Congress is eager to handover the powers through constitutional process. UML, on the other hand, has been demanding PM Deuba to hand over his powers to new ‘legitimate’ government. Amidst ongoing dispute, CPN (Maoist Center) is working to find a common solution to address the disputes and form a new government, informed Govinda Pariyar, press coordinator of PM Deuba. KP Sharma Oli, Pushpa Kamal Dahal, Mahanta Thakur of Rastriya Janata Party Nepal and Upendra Yadav of Federal Socialist Forum, Upendra Yadav were present in the meeting.